High-Flow, Stored-Pressure fire extinguishers are engineered to provide a quick discharge rate that enables the dry chemical agent to reach fires faster, thus providing increased firefighting capability when compared to a standard fire extinguisher. The High-Flow fire extinguisher is perfect for areas where highly combustible materials are present. They are ideal for use in propane filling stations, gas stations, automotive repair facilities, painting areas, marine terminals, and construction sites. A high-flow fire extinguisher is often deployed in conjunction with automated fire suppression systems. A high flow extinguisher will also shoot further allowing the user to be further away from exposure to the fire hazard. High-Flow fire extinguishers are available with either ABC, BC or Purple K dry powder in them. 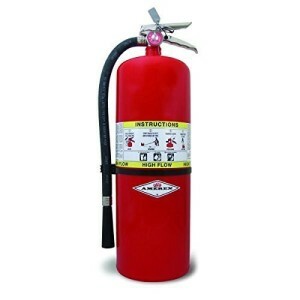 All Florida Fire Protection offers the best in High-Flow fire extinguishers from Amerex and Pyro-Chem. They are both leaders in the fire protection industry. To learn more about these state of the art systems, you can visit their websites or simply give us a call and ask us to set up a demonstration for you on how they can meet the fire protection needs of your paint booth business. There are a number of variables that determine the type of fire extinguisher needed and where the extinguisher is located. Most hazards fit within specific criteria involving the level of hazard (low, moderate, high) and the area of the hazard location. The hazard level, in conjunction with the square footage of the location, determines the type of extinguisher required and its location. Portable fire extinguisher types are usually defined by the extinguishing agent, weight and hazard type and area coverage. When a high-flow fire extinguisher is required, it is in recognition of a special hazard. Getting the right fire extinguisher to ensure worker and property safety, as well as being in compliance with local fire codes and the requirements of your insurance carrier is very important and can be complicated. Of course, you can wade through the various codes and regulations, or you can ask All Florida Fire Equipment to do the evaluation for you. We’ve been doing this for many years, and our experts will evaluate your needs and provide you with the most cost-effective solution to your fire extinguisher needs. The high flow fire extinguisher is an intrinsic part of having the right equipment for specific hazards. Hazards requiring high flow fire extinguishers involve two major characteristics: One being where pressurized flammable gas is a presence and the other being where there is the opportunity for a three-dimensional fire to occur. A three-dimensional Class B fire includes materials in motion such as pouring, running or dripping flammable liquids and generally includes vertical as well as one or more horizontal surfaces. Fires of this nature are considered to be a special hazard and require special fire protection equipment such as the high-flow fire extinguisher. Class B fires are those involving flammable (gasoline, alcohol) and combustible (diesel, oil, tar, grease) liquids. High flow fire extinguishers that comply with the above-mentioned hazards must be at least 10 pounds in size and be capable of expelling 1 pound of agent per second. The agent used is light in color, and the agent is designed to deflect radiant heat away from the operator.